Are you a first-time homebuyer, or thinking about dipping your toes in? 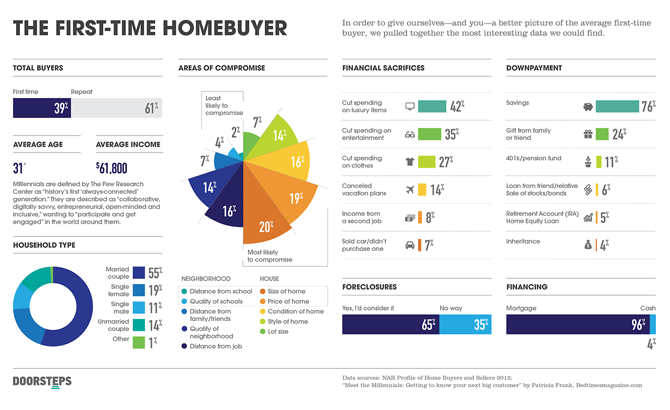 I like this infographic from Doorsteps that shows demographic info for first-time buyers nationwide. I’m particularly interested in how people are scraping together their first down payment and the financial sacrifices they made to get there. I recently taught a first-time homebuyer class that gave people new to the real estate game a taste for what the process looks like, and it was a huge success. I’m going to be offering it again late this summer (most likely in August). If you’d like to know when you can take that free class, let me know and I’ll add you to my list! You can e-mail me at sara@saragray.net.